Titles in RED focus on Wildlife management issues. An accurate portrayal of a baseline ecosystem is vital to biology and conservation work. It shapes decisions, initiatives, management, and defines a destination when conducting remediation and reclamation work. Baseline information, defined as ecological data collected at the beginning of a study or before disturbance has occurred is critical in any project as it allows for long term monitoring of environmental conditions. 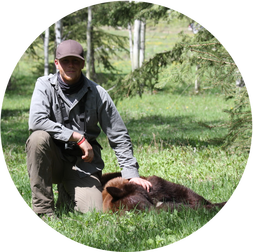 As Wildlife Biologist and hunter my passion is the outdoors. Having a career that allows me the opportunity to work and play in backcountry has given me the ability to become involved with tremendous individuals and organizations. I look forward to continued work and being part of exciting projects that promote scientific progress and conservation initiatives.